What Would Mike Do? : The hotel blog: First jobs, and inauspicious (however fortunately inconspicuous) beginnings . . .
First jobs, and inauspicious (however fortunately inconspicuous) beginnings . . .
My own first job in a hotel was working for a group of drug traffickers, who were using a pair of Durham, N. C. hotels as a money laundering operation. After I left that job, I was actually questioned by North Carolina Alcohol Law Enforcement (NCDPS - Alcohol Law Enforcement ) about their activities, told the ALE guys everything I knew (which amounted to . . . nothing at all other than that my former employers were people of highly questionable character, reputation, and wisdom - although by then, I wouldn't have put it past them at all to be involved in something like that, which was a big part of why I'd moved on to another job . . .). I then shared what I found out from the ALE guys with my former g.m. (we were still friends, and I was confident she wouldn't be involved in anything illegal); and while at first she didn't believe a word of it (she knew I didn't think too much of the company's 'owners'), I later learned from her, right after she resigned abruptly from that company, that I 'was right about them all along'. 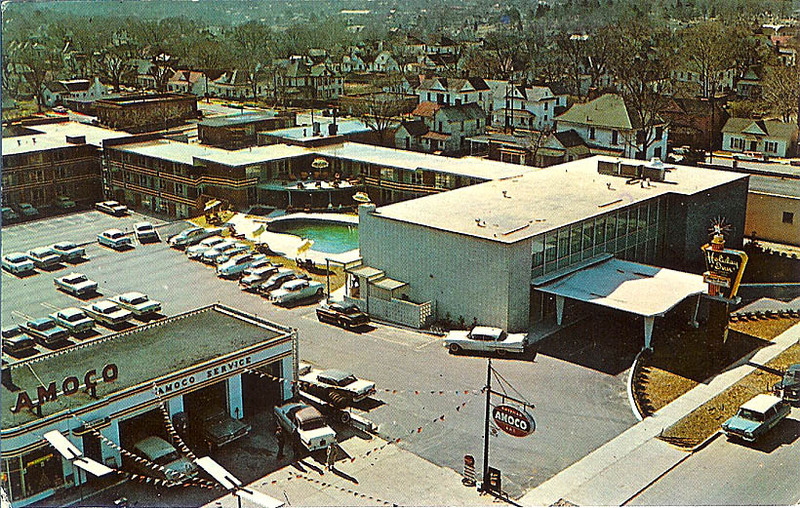 The 400 in its younger days, as Durham's original Holiday Inn. And I had been fixed up with that job by a Durham city councilman. I'd just finished school with a degree in architectural technology the year before, and had ambitions of making a career in real estate development. A local developer was on a hot roll (having just completed a major office building downtown, and the acquisition of two area hotels and much of the commercial stretch of Ninth Street that was popular with Duke students and ripe for redevelopment), and I wanted a job with that guy's organization. My friend the councilman was in good with him, and offered to make a call: I was to show up at one of his hotels in a couple days. He made the calls - he said - and I did show up at the hotel as we agreed, but nothing ever came of the calls if he did indeed make them. In better days, during its iteration as the Holiday Inn, prior to Imperial Inns buying and rebranding it. Probably a 'professional', publicity still for an advertisement - note the guy sitting next to the pool in a suit and tie? Then again, maybe not - notice the water splashed all over the pool deck? So, I ended up working, not for the big developer, but for the scuzbuckets to whom he had leased the two hotels. It wouldn't have made that much of a difference. Eventually our developer friend - a pretty big guy who'd originally come to Durham as a rice dieter himself - burned through the pile he had made as a manufacturer's rep inventing and importing the $5.00 K-mart calculator. During the few years he was hot and was the man in town to watch, he - with the sort of attendant publicity locally that would have made Donald Trump proud - bought a variety of commercial properties around Durham with cash flow challenges; hiring - and associating with - altogether the wrong kind of people to run them. (He had leased the hotels to just that sort of people. He turned out, for some strange reason which I'm perhaps even now better off not knowing, to have an affinity for Mob types, wiseguys and their wannabes . . .). His shooting star culminated in a noisy bankruptcy in 1991, with all of his Durham properties being foreclosed simultaneously. He managed to come out of that with his downtown office tower and his complex of nice studio apartments that were rented short-term by the more well-to-do dieters intact - those properties weren't losing money - but he would never again be the local legend in his own time that he once was. Using Hotels For Laundering Of Illegal Income 101 - The freshman course: This is where I learned - for the first, but not the last time - that it is possible to do a very successful job of repositioning a hotel, and have that be exactly the opposite of what the owners of the property want (even if they're not criminals), with the consequence that you'll be crapped all over in return. In the case of our bad guys, if you're going to use a hotel to launder money, you need a nearly-empty hotel and you need to keep it that way. Meanwhile, we were as innocent as lambs and didn't know what these guys were about, so when the hotel's general manager left a few months later, and Nancy became the g.m., we addressed the problem of our declining business, and set about trying to find a way to fill the hotel. We scaled up our best business, Durham rice dieters (The Rice Diet Program ), repositioned the hotel as an extended-stay property, and filled it up. I streamlined the recordkeeping and reorganized the front office operation. Although she was my boss, I had management skills she lacked; with her sales background, she had public relations skills that I lacked (and still lack to this day), so, being all each other had, we put the two together and it turned out to be a good fit even though our relationship had initially started off somewhat rocky. This sinkhole of red ink suddenly became a profitable property - which made it absolutely useless for laundering money, and our employers 'lost their lease', putting Nancy out of a job (I'd already defected to a nearby Days Inn once I'd heard noises about how they were going to shut the place down. I couldn't believe it at first - hey, we're making money now! - but the signs were still there and wouldn't go away, and I'd already begun to pick up on it that the people for whom I was working weren't necessarily the best kind of people to know . . .) The new 'lessees' were yet another bunch of people that were connected with the old. Nancy continued with the old company at their other hotel for a few more months, but began seeing things she wasn't altogether comfortable with, and she, too, left. Using Hotels For Laundering Of Illegal Income 102 - The second semester course: Although my brief hotel background at the time (apart from a few part-time gigs before college as a maintenance guy) was as a night auditor, even so I was at this point qualified to pass along to you . . . if you're going to show illegal income on your income tax returns as hotel revenue, your state sales tax and local occupancy tax also need to reflect a high average daily rate at a high occupancy. You can't just pay the local taxes on the revenue you actually made on your nearly-empty hotels. When the state and county sales tax people compared the state and federal income tax returns and the state and local sales tax returns from my esteemed first employers, and noticed that the figures didn't match, that's when the entire money laundering scheme collapsed. They took a hit on the back sales and occupancy taxes (I don't know if ALE ever was able to make a case about the drug trafficking), the 'owner' of the leased operation made a plea before the county commissioners for extra time to pay the arrears, both hotels closed down shortly thereafter, and the sleazebucket who headed the group moved on to own a bunch of 'gentlemen's clubs' in major cities all over the Carolinas. It got me my start in the business. I'd hoped for a little more, starting out, and was a little disappointed at first, but neither another job running a theatre nor as a drafter was an immediate possibility. Yet, I discovered here after playing with it a couple months that this was a business I could have some fun with and that might have a place for me that could be worked into something. These people in this 'ownership' group were slime, but it was more than I could hope to get out of 'good' people like, say, Marriott. I managed to get a job with my second hotel employer, a more reputable owner of Days Inns located in three North Carolina cities (Michael Forrest Jones' answer to Hotel/Hospitality Staff: what is the strangest or most memorable guest interaction you have had? ), while my not-so-reputable first employer was still coasting on the reputation of its former chain affiliation (the Imperial 400 had been owned by California-based Imperial Inns, now Vagabond Inns ), so I began a career of sorts with a decent reference having some pedigree value, despite the true character of the people for whom I'd actually been working. I'd stepped into a pile and come up smelling like a rose, hung out with big dogs without suffering the consequence of getting big fleas, played in doo-doo without getting too much doo-doo all over my hands . . . There are a lot of lowlifes in this business, as well as some very foolish people, and integrity is a quality that badly shows up as missing - even if you're dealing with (comparatively) respectable hotel owners, and even if you're not dealing with a criminal organization. (The owners of that Days Inn went into a decline after I left there, two of their properties were sold off and each had an unhappy ending, and the last I heard, their one remaining property was up for sale. This was - in the hotel business, anyway - my first, of many lessons that stick to this day in 'that's what you get when you lower your standards'. No integrity there. I've seen so many companies hurt themselves, and even collapse, by forgetting that lesson.) So, if you're a person of decent moral character and integrity, with half a brain, then you can go far . . . provided you are sufficiently discerning (much more so than I was starting out) to associate only with other smart people of good moral character and integrity . . . which, in the 'hospitality industry', is not always easy. I kept in touch with Nancy for a few more years before she - I guess - met Mr. Megabucks and moved to Florida: the last time I called her, her number was no longer in service. (She, too, ended up getting divorced within a couple of years after we met; but -- even though things looked promising a year or two after that, a few hundred miles away, for a week or so; and even though we'd hit it off so well back in Durham over time that she'd even made my ex-wife's list of suspects as an 'other woman' at the time my own marriage was collapsing -- I don't think we ever really had any destiny with one another beyond 'ships that pass in the night'.) If we ever do again reconnect, I've got to take her to Glamour Shots and have a pretty picture made of her so her portrait can hang in the lobby of my company offices, now that I have my own company; and in the lobby of that Durham hotel of my dreams if I eventually do have the opportunity to acquire or build one there. (Hers is the personality type that would get a kick out of something like that.) In her own very small, strange, but still very significant way, she helped get the whole thing started . . .